Expenses incurred and lease income generated on your managed properties can be tracked within Broker Brain, but this must be done from the Lease tab, NOT the Expenses tab. 3. Click the Expenses sub tab, shown circled below. 5. In the Memo field, enter a title for the income or expense. 6. 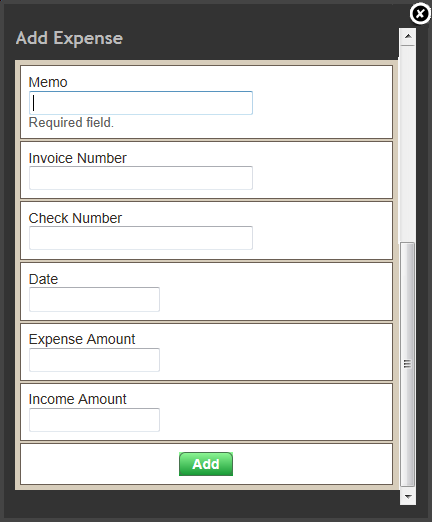 If desired, enter information into the Invoice Number or Check Number fields. 7. Add the date of the transaction in the Date field. 8. 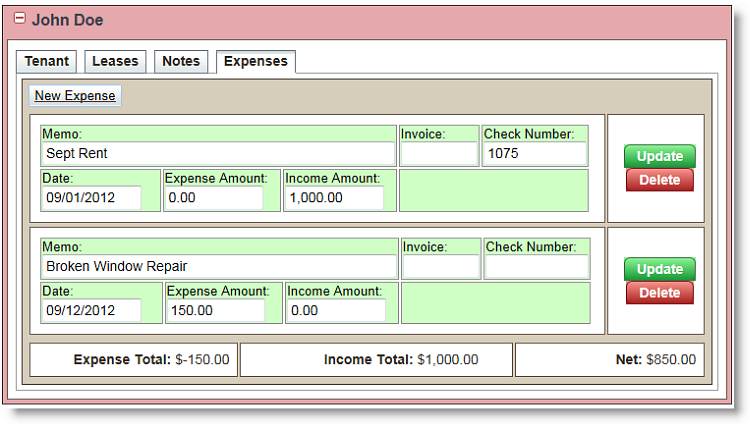 Enter a dollar amount in either the Expense Amount or Income Amount field. Note: You cannot enter information in both of these fields. If you wish to add both income and expenses, they must be entered separately. 9. Click the Add button. The information added will appear as shown below. You can remove an expense/income amount by clicking the red Delete button shown at right. You can make changes to any of the expense/income fields shown by entering information into those fields and clicking the green Update button, also located at right.